The Spinner S3 is made for home spin bike. It is based on the bikes made for commercial use. It’s not made to the specification as those bikes. But it is made to stand up to rigors of spinning workouts and training in the home. It has a simple traditional design that has been a favorite since it was introduced by Spinner. There isn’t too much to do to get it ready for your workout once it has been set up the first time. You can get on it quickly and get spinning or working out. No fussing around. They’ve been popular in clubs. So, you’d expect bikes from Spinner to do well at home too. At home there are a some other points you probably want in addition to what is needed at a gym. In my review go through all these aspects to let you know what you get with the bike to help you see how it matches up to your personal requirements or not. The bike has a powder coated frame and stabilizer bars. This helps to make it rust resistant. The steel frame and cross bars keep the bike steady with no shaking or wobbling while you’re up out of the saddle sprinting and hill climbing or in it. Moving between sitting and standing there is no real movement. You won’t be experiencing the feeling that you might fall off at any time! You can just get on with getting the most out of your time on the bike. There are levelers under the stabilizer bars that allow you to level up the bike to prevent rocking from side to side if there is some unevenness in the floor. The warranty for the bike is 1 year but no labor. This is an okay length on the bike but disappointing on the labor. There are better warranties available. As this series of bike hasn’t been around for that long it is difficult to determine how durable it is going to be, it seems to me it should prove to be okay in this respect. This is based on the company being focused on spinning bikes and its’ reputation with commercial grade bikes from customers. The bike can be adjusted to fit people between the heights of 4ft 10 ins and 6ft 7 ins (depending on leg length). To do this you can change the position of the seat backwards/forwards and upwards/downwards. The handlebars position can be adjusted upwards/downwards. Making the adjustments is quick to do using the adjustment knobs and sliding the poles into position and tightening into place. It uses pop-pins and pre-set holes to hold them in position. This is great to ensure there is no slipping as you workout providing a good level of safety. You may find that you can’t quite get the adjustment right for your upper body due to the handlebars not adjusting horizontally, but for most people it won’t be an issue. The adjustment poles are marked to guide you to adjust the bike for your fitting if it has been moved since you used it. You can also use a permanent marker pen on the poles to help with this. To provide a more stable handlebar with less play and moving around it has an oval post which makes it easier to get it tightened up. As well as getting the bike set up for the most workout the speed means it can be easily used by multiple users to get their cardio workout. The bike has a friction pad that sits on top of the flywheel. The amount of resistance is controlled by the resistance knob at the top of the frame. You turn it clockwise to increase and counter clockwise to decrease the amount resistance. It starts with none and gets steadily harder as you turn until it is almost impossible. The direct screw type resistance allows for a good consistent grip on the flywheel by the pad. You can set the resistance where you want. It goes up incrementally so you don’t go from easy to too hard with only a small turn. As with most spin bikes there are no markings to let you know how hard you’ve set it – you have to do this from feel and your own estimate when setting and returning to a previous level. The pad will wear down with use and need replacing from time to time. It isn’t difficult and replacement pads can be sourced from Spinning and there are instructions in the manual on how to replace and order. There is a guard over the resistance that protects the pads and flywheel from sweat by directing it a away from it. Sweat is very corrosive and can shorten the life of the pads and flywheel. It’s a difficult place to get to wipe down. The chain drive gives you a similar feel and noise to using an outdoor bike. It works with the perimeter weighted 31 lbs flywheel to provide a fluid pedaling motion that is low impact and natural. The weighted flywheel helps to pull the pedals through to promote a good 360 degree cycle motion. You also do need to do similar type of maintenance on the chain – the tension may need adjusting and it may need lubricating too – depending on usage. It is straightforward and is described in the manual. You don’t need to be a specialist to do it. The pedal motion won’t be as smooth as you get with heavier flywheels especially as you get towards the top end of the resistance. The bike has a fixed gear which means that when the flywheel is turning so are the pedals. You can’t coast – it keeps your feet moving! If you need to stop quickly you push down on the resistance knob and it uses the pad as a brake to stop the flywheel and pedal from turning. To stop otherwise you need to do this by gently slowing down rather than trying to stop suddenly which adds too much impact on the joints and can cause injury. There is guard to protect the chain drive from sweat and damage. This guard also protects your ankles and keep children and pets from injury too. However, the flywheel is not enclosed so could hurt someone if they touch it while it is moving. When not in use there isn’t anything to stop the pedals being turned other than tightening the resistance up as much as it goes to prevent any mishaps with children etc. The bike’s pedals are standard pedals with a toe cage and strap. You slip your foot into the cage and adjust strap to get a custom fit for your shoe size that helps to keep your foot form slipping off it. It is designed for use with athletic shoes. The crank is 3 piece so it provides a good solid base for pedaling and is tough enough and should be durable for standing up on the pedals pushing against the resistance for many years without any issues. If you want you can swap them out for your own pedals if you have a set you prefer. The bike has a narrower q-factor than other bike in the price range (and above) which allows for more alignment of the legs for a better feeling stroke and more comfort. It also makes it feel more like a regular bike. Seat. It has a padded and oversized seat that helps with comfort on the sit bones as well as helping with balance. This will be fine for some people but not for others. As with any bike seat it can take some time to get used to it, especially if you’ve not spent much time on a bike (indoors or outdoors). But some may still find it too hard or uncomfortable to get the exercise they want. If that is the case you can try padded bike shorts and/or a gel seat cover to get the necessary comfort. If that doesn’t work you can replace the bike seat as it does fit standard size bike seats. (Before doing this you may also just want to check it is properly centered and level, just in case). Handlebars. These are oversized and covered for a good comfortable and secure grip. This will stop hands slipping or getting sore during the long workouts. They have the standard spinning design to cater for the classic hand positions for workouts but don’t have drop bars or allow for the aero position as you have on outdoor bike. Noise. The bike isn’t silent. You can hear the chain moving (like a road bike) and the friction pad rubbing on the flywheel. It’s not that noisy and probably won’t disturb others in another room. If you want to watch TV you’ll need to turn it up a bit. Dirt and Dust. You may notice a little dust from the resistance pad and maybe some lubricant from the chain drive, but overall there is little mess created by the bike. The biggest source of cleaning is likely to be from people sweating and this dropping on the bike and floor. Although the bike has been coated to prevent rust it is important to wipe it down after use to reduce the effect of this over time as it is very corrosive. Also, if you want to protect your floor it is a good idea to put the bike on rubber exercise mat. The bike is reasonably compact needing an area of 18 by 43 ins when not in use, It is probably too big for a closet so it is more likely to be stored against a wall or maybe under the stairs or in a corner if you don’t have the room to leave it out. To help with moving the bike it does have two transport wheels at the front of the bike. You tip the bike onto them. With most of the weight at the front of the bike tipping and moving the bike isn’t too difficult. It is possible for one person to do it without straining themselves. The wheels have enough area around them they they’ll work on all surfaces but the softest carpets or those with a deep pile. If you have wood floors before moving the bike all the way across it you might want to check that they don’t scratch or leave dents in it. The bike is delivered part assembled. To complete the assembly normally takes about 1 to 2 hours. Everything to needed to do come with it including the tools. The instructions and diagrams are clear. The parts fit together. The most difficult part is the weight of the carton and the bike – the shipping weight is over 96 lbs. (Assembled it weighs 96 lbs). You might want two of you to help with this and holding pieces and bike as you add them to the bike. But one person can do it if you are prepared for some awkwardness when trying to hold a piece and attach it to the bike. The bike doesn’t come with a console. This is not unusual for spin bikes, leaving you to monitor your performance on your own. And many people prefer to do that – it just isn’t for me. I like to have something I can see during the workout and afterwards too. You can buy one for the bike separately from Spinner (for under $70 when I checked). It is called the Spinner Bio Wireless Computer. It measures cadence, speed, time, calories and distance. It is possible to add a standard bike computer to these bikes but you do need to do a little a DIY to get it on – especially adjusting the spoke magnet to fit on the flywheel. 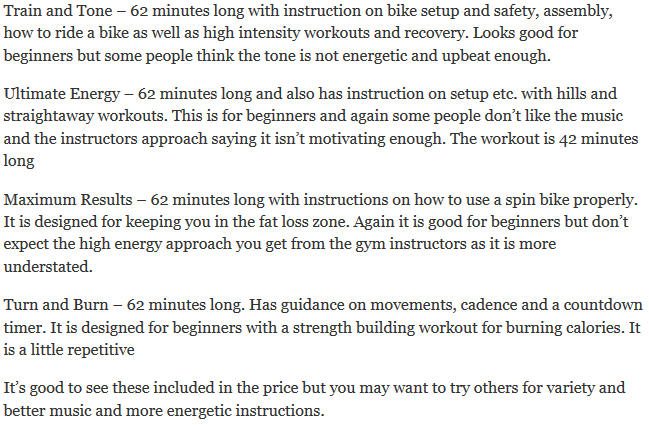 You don’t get a lot in regards to extras with the bike, which is normal with spin bikes. There is a gravity held water bottle holder on the frame which puts it in easy reach as well as making it easy to grab and replace – you don’t have to try and slide it out and in as you do with a holder. You may find that you drop sweat on it though and when getting off the bike if you have left it the bottle in the holder you may find yourself kicking it or tripping over it if you get off through the bike. Unlike many bikes it comes with 4 Spinning DVDs that can be a big help for beginners. They have workouts and getting started guides. At present no customer has left a review on the bike due to it only being recently released. Reviews of other bikes from Spinner have shown they are on the whole well received and you’d expect the same to be the case with this bike. They do have lots of experience with these bikes as they did create the original spin bike. It is a reasonably priced bike. For this you get a basic but well built bike that should provide many years of (enjoyable) workouts for fitness and health in your home. When compared to the price of the gym and classes it can make for a good deal. It is a little more than some other makes but is made by the people who specialize in these bikes and has things like guards and protection of the resistance and flywheel to protect it from different sources of damage. This is a good bike for beginners and up to intermediates. It’s 31 lbs flywheel won’t suit those more advanced as they’ll be looking for tougher workouts that need the extra inertia to keep the smooth pedaling motion at higher speeds and resistance. (See Spinner Edge for a bike designed with more advanced people in mind, although it can be used by beginners too). It’s easy to move around with the transport wheels which make it easier to keep it out of the way when not in use..
It’s not silent but it’s not too loud so it won’t be annoying others when in use. It doesn’t come with a console to help you keep track. I’d like this bike more if it did but not everyone wants this, so I guess it helps with the price. Overall this is a good solid no frills bike that all the family can use to get workouts and training in the home. It should give years of service standing up to the use and abuse of cardio workouts. Looks like a great bike to start with! I agree it’s a good bike to get started on. This bike actually looks really comfortable and durable which is rare these days.